Taco Soup - ready in under 30 minutes! Love this version with green beans and BEER! Hamburger, pinto beans, green beans, ranch beans, stewed tomatoes, beer, diced tomatoes and green chiles, taco seasoning and Ranch dressing mix. We make this at least twice a month. SO good!! Can freeze leftovers for a quick meal later. You can also make this in the slow cooker. We are obsessed with the Taco Soup. I've made this so many times that I've lost count. This version is different that my usual version. 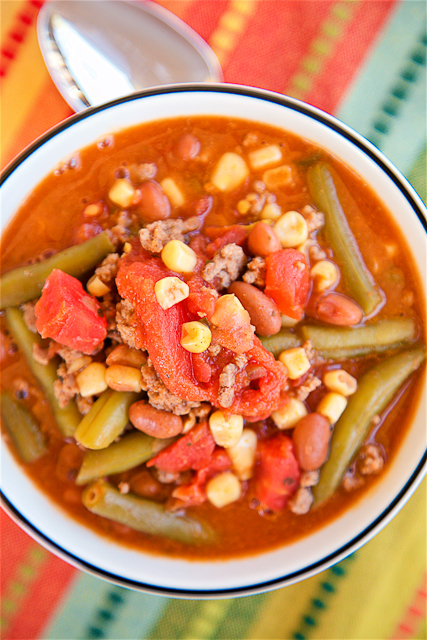 This version of Taco Soup has a bottle of beer and some green beans added. It is CRAZY good! Chicken Legs requests this at least once a week. It makes a lot. It tastes great reheated and you can even freeze the leftovers for later. 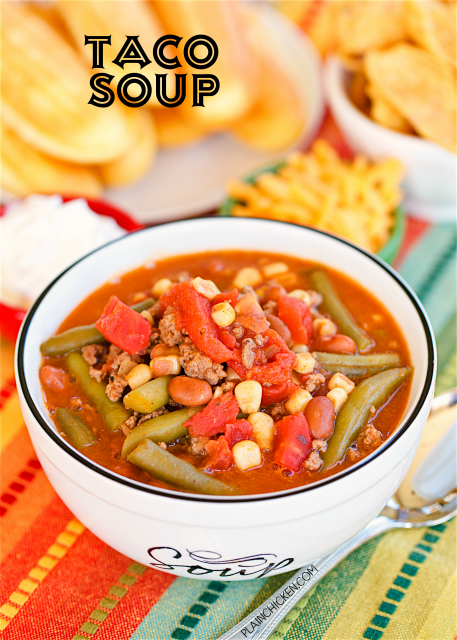 I make this Taco Soup on the stove and it is ready in about 20 minutes. You can definitely make this in the slow cooker. I would cook it on LOW for 6 to 8 hours. This would be great for a party or potluck. Just whip up a batch of cornbread and you have a super quick and easy meal!! In a large stockpot, cook ground beef until no longer pink, drain. Return to pot. Add remaining ingredients to the pot, bring to a boil. Reduce heat and simmer 25 minutes. Thinking about making this tonight, with a little added sweet onion of course! I guess I should know this as I am a seasoned cook, but what are ranch beans? I don't think I have ever seen them on a groc shelf? Thank you and now that I see this I think I have seen them. I enjoy your recipes and have tested many of them in my kitchen . They have all been great . I live on Lake Martin near you and always enjoy your posts.